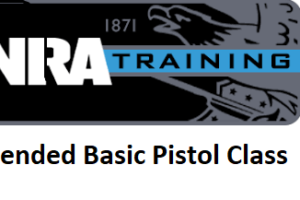 Blended Basic Pistol Course Sept 15th, 2018… | Blue Ridge Cherry Valley Rod and Gun Club Inc.
Part one is the NRA On-Line study program, which must be completed prior to taking the Part Two Instructor Lead Exercise & Shooting Qualification Class. Anyone wishing to take this class — Must Register a minimum 3 weeks in advance of the Part Two Instructor Lead. This portion of the course is at least 4-6 hours long and includes range exercises and live fire instruction for all types of pistols (revolvers, semi-automatics). Students review NRA rules for safe gun handling; pistol parts and operation; ammunition; shooting fundamentals; range rules; shooting positions alternatives. Students will receive the NRA Gun Safety Rules brochure, Winchester/NRA Marksmanship Qualification booklet and course completion certificate.